This falls into the category of, "I'm not making this stuff up, folks!" At first I thought combining dreamwork, martial movement and writing practice under one umbrella as "Dream Warrior Training" was a brilliant, revolutionary new idea. But slowly it dawned on me that there have actually been many traditions through history in which trained warriors were expected to also be refined individuals with skills and sensitivities honed by the arts and sciences. Your average Roman army officer, for example (at least during the Republic period, and the early Empire period) was a nobleman who'd been raised on poetry. He was familiar with and could recite a catalogue of verse. And very likely he evened penned a few himself occasionally. But more immediately relevant to the themes of Dream Warrior Training is the lifetime of Chen Tuan (10th century AD). Chen Tuan is revered in Chinese culture as one of the great Taosist sages. He is credited with inventing and/or refining the movements that have come down to us as kung fu (which the Chinese actually call wushu; wu=martial + shu=art) and qigong. He is also famous for being a pioneer and master of "sleep meditation"; a cousin of what is popularly known as "dream yoga" nowadays. Dream yoga is the version of this discipline practiced by Tibetan Buddhist monks. 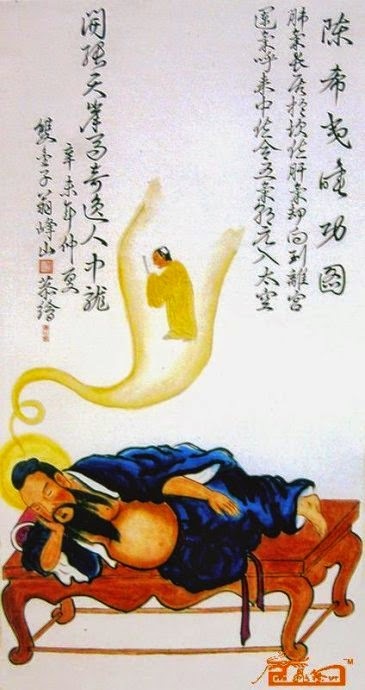 There is a surprising amount material on the internet about Chen Tuan and his sleep meditation practices, since he was as central a figure to Chinese spiritual history as, say, St Francis or Martin Luther are in the West. Dream warriors have existed since the beginning of the human race. Another example is a special guard squad maintained by The Emperor of the Chinese Qing dynasty. Those were not just skillful warriors and swordsmen; they also had the knowledge of and skills in painting, poetry, music, calligraphy, history, exact sciences and mathematics, medicine and statecraft. Also interesting how different traditions come up with similar practices or different practices that serve similar purposes. I'm enjoying your new blog. Hey I thought of a book you might want to check out: The Way of the SEAL by Mark Divine. A lot of good exercises that I'm putting into use myself. He talks a lot about the ethos of the warrior. A lot of good stuff in it for writers and magi. I'm very much taking a warriors approach to my magical training these days... an its paying off. Justin! Good to see you hear, fellow oneironaut. I'll definitely check out that book.